Just got this ready to go in but not sure if I can be arsed stripping the bike down ...again just to fit the bastards . The front LED's are pretty bright anyway so just have to wait and see if I get time . A humble suggestion. What do you think of painting the surround black? It's subjective, I mean silver and red vs black and red. Depends on your tastes. Black would look better than the silver reflector. No doubt. The downside would be any light reflected back from the plastic lens, would be absorbed by the black, where as the reflected light against the silver would get reflected back somewhat outwards again. I think with standard globes/projectors you need all the help to project forward. I have put the unit together and it looks OK . Anyway , I can't be arsed fitting it now I have the other LED strips fitted so if anybody wants to take it off my hands and cover postage and what it cost me , PM me . Is there anywhere else I can put it to see if anyone wants it ? Damnit. 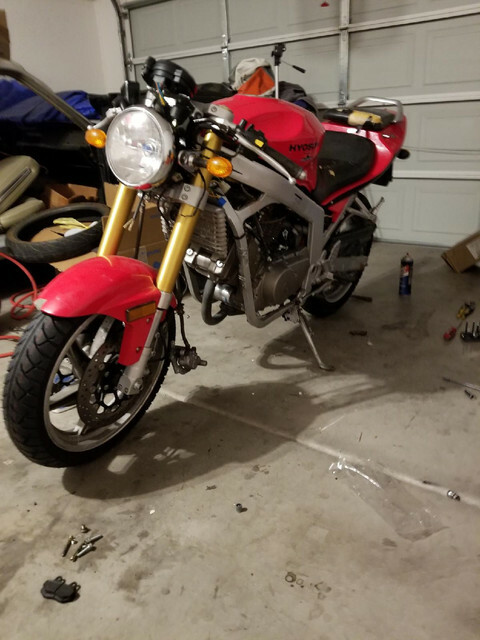 I replaced my fairing light with a naked bike light to make a Streetfighter/ cafe racer looking thing. Had I known you had a project going on I would have just given you the old light before taking a hammer to it for the lols. 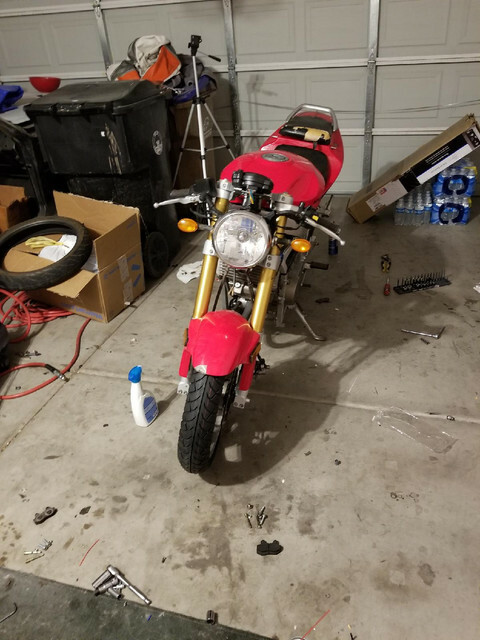 I only paid $50 for the headlight anyway so no big deal and the halo's are pretty cheap . If I did fit the halo headlight , the front of my bike would be like a lighthouse now I have the LED strips fitted . Do you have any pics of your light mod ? give me a minute. I'm waiting for a bracket but I zip tied the light for your viewing pleasure. Observe the custom chineseium gauges. lol yeah. waiting on brakes. looking for a cheap rear rotor but no luck.